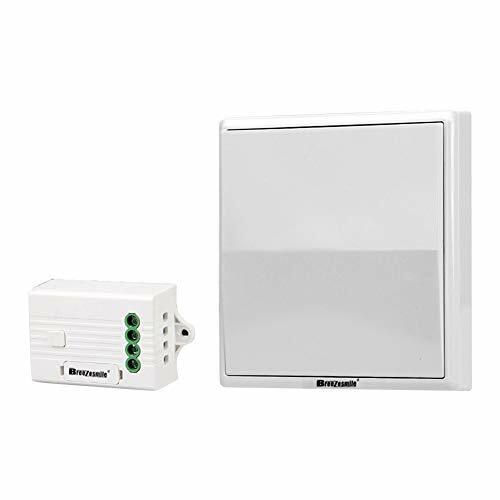 Breezesmile Wireless Switch Kit use Micro Energy Acquisition Tech.. It is Powered by Pressing Switch Panel to Transmit the Signal. No Pulling Wires to your Switch Location, No Tearing Walls, No Battery. Quickly Add Switch to your Light or Remodel Existing Switches. Easily Design your New House Decoration or Old House Remodel Dreams! * No battery, no wiring /Wifi/App required. * Receiver is simply wired between light fixture and power supply. * 100ft indoor use, outdoor up to 520ft. * With built-in fuse, overload protection. * Over 20 years lifetime, 3 years warranty. A receiver offers one channel output. It could be paired with multiple switches for flexible control. Also one switch could be paired up multiple receivers to control a group of lights. Switch Size: L3.4" * W3.4" * H0.6"
Receiver Size: L2.8" * W1.7" * H1.1"